“You’ll see, how dramatically things have changed and how much controversy there is about cancer screening and surveillance,” said Alan Wasserman, M.D., MACP, the Eugene Meyer Professor of Medicine, and chair of the Department of Medicine at the GW School of Medicine and Health Sciences (SMHS). “You would think this would be a black-and-white topic, but it’s not; it’s changing all the time. Part of the reason we wanted to have this event was to show what has changed and what needs to be done. 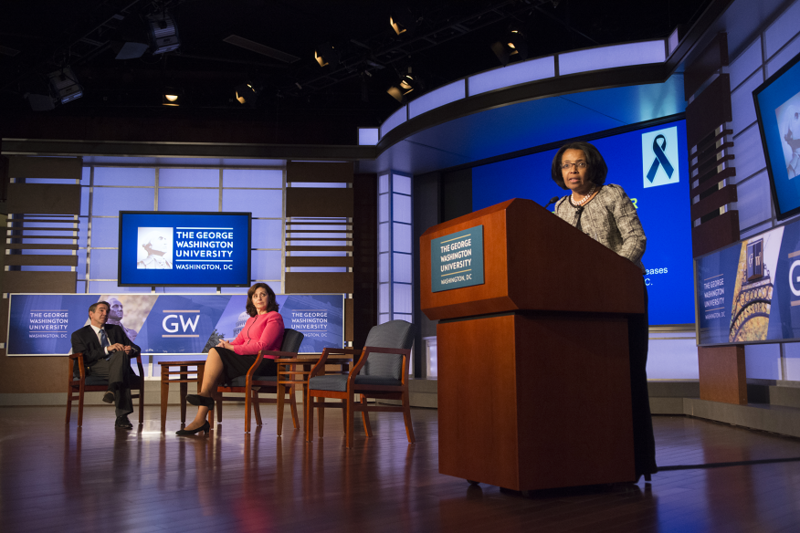 “What You Need to Know about Cancer Prevention and Screening,” was the latest installment of the Frontiers in Medicine series, held on Oct. 14, designed to connect members of the Washington, D.C. metropolitan community with renowned health experts. The panel featured three SMHS physicians: Thomas W. Jarrett, M.D., professor and chair of the Department of Urology; Rachel Brem, M.D., professor of radiology and director of the Breast Imaging and Intervention Center; and Marie Borum, M.D., M.P.H. ’95, professor of medicine and director of the Division of Gastroenterology. Jarrett, Brem, and Borum, speaking about prostate, breast, and colon cancer, respectively, pointed to several of the same guidelines of preventative care. Screenings should typically begin around age 40, unless a family history of the disease or a high risk — particularly for African Americans, who are more susceptible to various kinds of cancer — necessitates an earlier screening. Once a patient has been screened, they should continue to get screened on a regular basis. In the case of prostate cancer, the number two leading cause of cancer death in men, screenings include a prostate specific antigen (PSA) blood test or a digital rectal exam. A biopsy is required before a physician can determine the diagnosis, but the screening assesses who might be at risk. “Since the advent of PSA screening, there’s been a dramatic decrease in the death rate for prostate cancer,” Jarrett said. The problem with screenings for prostate cancer arises with recommendations, such as those from the United States Preventive Services Task Force (USPSTF), an independent panel of experts that reviews the effectiveness of clinical preventive services. In 2012, USPSTF recommended against the PSA screening, citing the benefit of the screening did not outweigh the harms of treatment, such as overtreatment and severe side effects associated with treatment such as incontinence and impotence. The primary method of screening is mammography, which has contributed to a 30 percent decrease in breast cancer death rates over the last two decades. Women should get screened every year starting at age 40, but the USPSTF determined the more appropriate age was 50. “We know definitively that one in six breast cancers in the United States occurs in women in their 40s, that women in their 40s have more aggressive cancers, and it’s critical to diagnose them earlier,” Brem argued. The USPSTF also recommended against clinicians teaching their patients self-examinations and suggested that multiple screenings and biopsies cause undue stress on a patient. Brem disagreed. “As someone who has been taking care of women with breast cancer for 30 years, I can tell you, the fatigue and stress of telling someone they have metastatic breast cancer is far greater than telling them they need to come back for another mammogram,” she said. Colon cancer can be cured, but the key, as with the other cancers mentioned during Frontiers in Medicine, is early screening. “You want to try to catch the cancer before it catches you,” Borum said. Despite USPSTF recommendations, all three physicians recommend screening: screening early and screening regularly.